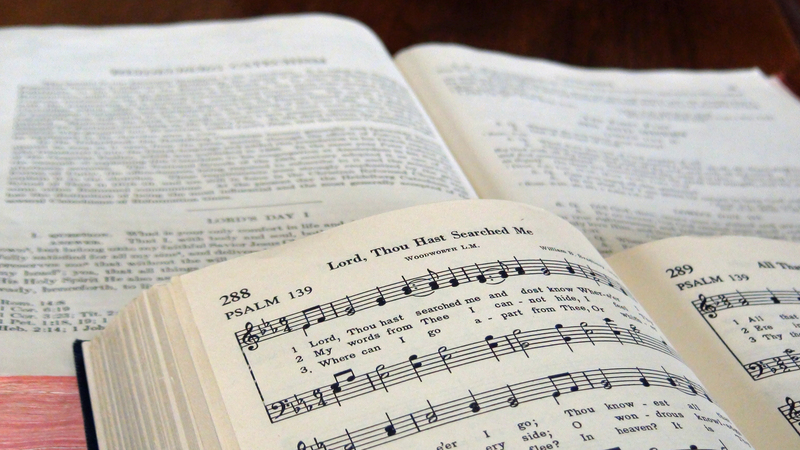 For the past two years URC Psalmody has been consistently following the progress of the Psalter Hymnal project of the United Reformed Churches in North America. Much has happened since our beginning in December 2011: the Songbook Committee’s Hymn Proposal was released and critiqued; Synod 2012 approved the Orthodox Presbyterian Church‘s invitation to work together to produce a joint Psalter Hymnal; and, just last summer, the two denominations’ Psalm Proposal was released online for review by church leaders and interested members. Reporting on this project has been fulfilling but also challenging; there are always more psalm versifications to be considered and more musical viewpoints to be investigated. Thanks to the work of Orthodox Presbyterian minister Dr. Peter Wallace, however, URC Psalmody is no longer alone in this task. Himself a former member of an OPC subcommittee related to the Psalter Hymnal project, Dr. Wallace has undertaken a series on his own blog, The Cross and the Kingdom of Christ, working through each setting (!) in the URC/OPC Psalm Proposal. So far he’s treated Psalms 1-5 in great textual and musical detail. Readers, if you’re at all interested in the work on our proposed Psalter Hymnal, I would highly recommend regular visits to Dr. Wallace’s blog, especially for cross-referencing with the online collection available at PsalterHymnal.org. You won’t be disappointed. Meanwhile, back here on good old URC Psalmody, we’re looking forward to further collaboration with Dr. Wallace and a wide variety of other Reformed musicians in the year 2014. Since the URC’s synod, which convenes again this summer, will face the task of approving the Psalm Proposal, we hope to spend plenty of time specifically discussing the practice of psalm-singing in our churches from a variety of angles. Along the way, it’s our goal to bring the blog back up-to-date in a number of aspects, including the Psalter Hymnal project area and the Psalter Hymnal Resource Library. Although URC Psalmody may still experience some quiet spells (I begin my second semester of college in nine days), we hope you’ll stay with us!